Nausea or vomiting, commonly called morning sickness may occur during the early months of pregnancy. It usually disappears after the third month. • Before you get out of bed in the morning, eat a few crackers, a handful of dry cereal, or a piece of toast or dry bread. Put these within reach of your bed the night before. • Do not brush your teeth as soon as you get up in the morning or soon after you eat. • Avoid sudden movements and try and get up slowly in the mornings. • If you feel nauseated between meals, then drink small amounts of apple or grape juice. • For some people avoiding greasy and fried foods help. • Make sure you have fresh air in the room you sleep in, and cook with open windows or with the exhaust on to get rid of odours. • Eat unseasoned and mild-flavoured foods. • Drink clear, cool beverages and try clear soups. 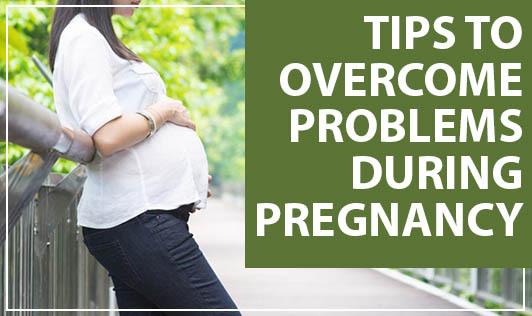 Constipation is one of the common problems during pregnancy. This happens during pregnancy because the muscles in your intestines become more relaxed. Iron and calcium supplements can also cause constipation. Inadequate intake of fiber and fluids, and irregular eating habits are the other factors causing constipation. How to prevent or treat this? • Increase the intake of high-fiber foods such as unrefined grains, fresh fruits, and vegetables. Also try softer high fiber foods like oatmeal, legumes, prune juice and barley to help soften the stool. • Daily exercise can also help. Do not use any type of laxative other than bulk-producing ones unless under the supervision of the health care provider. • Avoid foods like broccoli, cabbage, cauliflower, onions, etc which are gas-forming. • Try and avoid greasy, fried and spicy foods. • Keep sipping on water. • Avoid lying down for two hours after eating. • Cut down on beverages that contain caffeine.